That something - the hard coating of cowpea mosaic virus - caused no detectible side effects, which are a common problem with traditional therapies and some immunotherapies. “The cowpea virus-based nanoparticles act like a switch that turns on the immune system to recognize and fight against the tumor - as well as to remember it,” said Nicole Steinmetz, an assistant professor of biomedical engineering at Case Western Reserve, appointed by the Case Western Reserve School of Medicine. 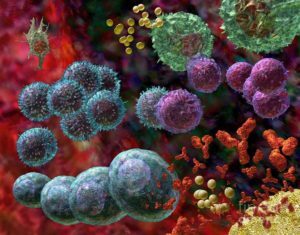 To restart immune defenses, the scientists used the tumor itself as if it were the antigen in a vaccine - that is, the target for antibodies produced by the immune system. The cowpea virus shell, with its infectious components removed, acts as the adjuvant - a substance that triggers and may enhance or prolong antigen-specific immune responses.